Suppose people use illegal drugs but have not committed any other crime. In general, should such people be treated as criminals and brought before the courts, or should they be treated as people who may need medical treatment and other forms of support? So more than two thirds of those who expressed a view and nearly two thirds of all respondents think that drug users should not be criminalised. Given this sort of finding, I find it bizarre that politicians and ministers are still unwilling to enter a serious debate about decriminalising or legalising drugs. The reasons I hear again and again are that it is politically difficult to do so and that's why most senior politicians are not willing to engage with it. But how on earth can that be true when the majority of people actually think drug users should not be being criminalised? And what does it say about our political structure that these people and that view are largely being sidelined? A shrewd politician would surely be able to find the words and the approach to go with this very strong grain of public opinion? So who from the senior ranks of all parties is going to step up to the plate and speak for two-thirds of the British public on this subject? Osborne says Royals cost us 51p per person per year. I have no doubt that George Osborne's figures are accurate for the direct cost of the Royals*. But isn't it interesting how when Osborne is talking about something that he wants to spend money on (and you can't get much more Royalist than true blue Tories like our beloved Chancellor) it's presented in a way that tries to make it look miniscule? Almost as if it would be churlish to disagree that the Royals are worth every darn penny and anyway it's less than the cost of a mars bar don't you know and didn't she look radiant on the wedding day and sure the Duke occasionally says the wrong thing but he's been such a good consort for her etc. etc. etc.? For example, I don't remember the (made up) figures for the cost of switching to AV being presented by the Chancellor in the format of cost per person per year (the real figures for this would have been less than 51p per person per year). Oh no, it was how many sick babies will suffer and how many soldiers will (implicitly) die because of lack of the millions that were supposedly going to be spent. What what does this figure of 51p per person per year actually mean? Well the figures have just been released for the UK population last year. It was 62,262,000 (see here). I am assuming he is using the most up to date figures so this would be a total of £31,753,620. Or if you want to look at it another way, and a way that politicians like Osborne usually love to do it is approximately 6 new primary schools every year at a cost of just over £5m per school (source). But the currency politicians simply adore using regarding public spending is nurses. How many extra nurses could we employ each year for the cost of the Royal family? Well according to salarytrack.co.uk the current average salary for a nurse in the UK is £26,123 per year. Let's add on 13.8% for employers' NI and that gives us a total salary cost of £29,728. So we could get around 1068 extra nurses each year. Imagine how many more lives each year could be saved and how much more comfort and care could be provided for that amount of money. Suddenly that 51p per person per year seems a lot bigger doesn't it? I know what I would rather spend the money on. *I say "direct cost" because this does not include the cost of things like security and civic receptions etc. It's hard to know what the total cost is but I have seen estimates previously (e.g. here) of around £100m. So maybe the real cost is more like 3000 nurses. I agree with you, but actually I'd say you can get even more nurses for your Royal Family buck! You've ADDED the employers NI cost - and fair enough that IS a cost to the Dept. of Health... but not to government spending overall because the Treasury, obviously, gets that money back. The actual cost to the exchequer of a nurse (or ANY public sector worker) is their salary NET of tax, so in the case of a nurse on £26,123 that's c£20,150 net of tax and NI. Mark Pritchard is an MP whose existence had not imprinted upon my conscience until this week. He holds the seat for The Wrekin for the Conservatives and on Thursday the Commons decided in favour of a ban on circus animals following a motion moved by Mr Pritchard. The decision is not binding on the government but it does put them in an awkward place politically given their current position on this subject. Much of the coverage has been about how the MP was allegedly threatened and bullied by the No 10 machine to try and get him to withdraw the motion (which he stood up to and refused). But the thing that caught my eye most about the story was how a number of Labour activists and sympathisers on Twitter started making comments like "It's all very well sticking up for circus animals, but what about people on benefits.." etc. This is something I see happening a lot in politics. I have seen it referred to in the past as "Whataboutery" which I think is an appropriate term. It is a way of attacking something without necessarily disagreeing with it but diverting the discussion onto different terrain. Probably lots of the Labour people who were doing this actually agree with the proposal but are trying to make out that Mr Pritchard is somehow wrong to be focusing on it. I disagree. Lots of MPs have special causes that are dear to them for particular reasons and they should be commended when they use their positions to spark an honest debate and ultimately persuade lots of their colleagues to agree with them and perhaps do something about it. I confess I do not know much about the details of the motion or the current state of how circus animals are treated but I admire the fact that this back-bench MP has been able to make the weather on a subject that he clearly feels very passionate about. I would certainly not try to diminish what he has done on the grounds that there are other causes that are more dear to me (which of course there are as regular readers of this blog will know!). I am sure there will be plenty of time to debate all the other things that the activists who piped up last week also want covered. It doesn't mean it is wrong to try and make changes in other, possibly less important areas too. Am I the only one bored by political defections? A Conservative councillor in Cornwall has defected to the Lib Dems (reported here on Lib Dem Voice). Every week or two there will be some political defection reported somewhere at some level. Often council, sometimes MEP, occasionally MP (although we haven't had one of them for a while - I think Quentin Davies was the last one) or MSP, MA etc. Is it just me or is this sort of thing, you know, well, boring? I know the dynamics that have been behind some defections in the last few years and there are often local factors at play and of course personal ambitions and all sorts of things that would never be admitted to in whatever official statement is released. In other words it is going to be pretty much impossible for an external observer to get the real reasons behind the defection. Often as well I find that the party receiving the new convert goes well over the top in highlighting the significance and we sometimes get the counter-spin operation from the jilted party. Yawn, yawn, yawn. People change their mind about stuff all the time in real life and change jobs to work for competitor organisations too. Why, when it happens in politics do people think it means anything significant? It almost never does, whatever party is being jumped from and to. The Daily Telegraph had a rather forthright leading article yesterday entitled "Political failure has scuppered NHS reform". In it they took both David Cameron and Nick Clegg to task for having given in to pressure on the NHS reforms and regretted how in their view the essence of the original bill now "lies in ruins". Mr Clegg has pulled the plug on a set of proposals he was happy to go along with until his activists told him otherwise. That was a failure of leadership. This is how a healthy political party is traditionally supposed to work isn't it!? The members who make up the grass-roots footsoldiers vote on and decide the policies. That's how Labour used to work. The Tories have always been much more top-down but I know many Tory activists who lament the fact that they are unable to decide on their own policy. Irrespective of the other parties that is always how the Lib Dems have worked. It is one of the things that attracted me to the party in the first place, that I could have a real say in policy. And in this case it was a vital part of the way government policy has been altered. The coalition agreement was sketchy on the detail for the NHS and the recent Lib Dem conference made it very clear what the party in government needed to do to satisfy the party at large. To attempt to characterise this as a "failure of leadership" by Nick Clegg is to fundamentally misunderstand the nature of the party that he leads. Other parties may impose policies from the top. The Lib Dems do not. I think many people will start to realise this following the changes to this bill and perhaps some will consider it to be a much more democratic way of deciding a party's policy than it being cooked up by a cabal in Westminster. It's the naming convention stupid! I watched Panorama yesterday which was about whether banks had learnt their lessons from the various misselling scandals of recent years (e.g. Payment Protection Insurance). They used undercover filming to show how financial advisers in various banks don't seem to be following the correct procedures or guidelines when it comes to advising people about how to invest their money. One of the biggest bones of contention was regarding people's attitude to risk. They had numerous examples of people who they interviewed who strongly felt they had been misled or even in some cases hoodwinked into investing in products that were much more risky than they had thought. The undercover filming appeared to show the potential for this to happen. However I felt that the biggest problem the programme highlighted was in how the naming conventions used for products can be utterly misleading. They followed an undercover reporter who had made it clear to the adviser that they wanted to make sure their investment was low risk. As the adviser took them through the process they kept referring back to how they understood the level of risk the person wanted was low. This happened a few times in the clips they showed. Then at the end of the process the adviser proudly announced that the best product for the customer was something called a "balanced fund". The customer agreed this sounded right. Cut back to the experts watching the footage all of whom straight away made it clear that the "balanced fund" referred to was not appropriate for the customer and was too risky given what else had been said. Fair enough. They know best and I would fully accept their arguments. But had this been a real life situation I would not be at all surprised if a real life customer would have accepted that too. Of course all customers should read the small print and be sure they are clear what they are getting into but a product described as "balanced" would seem to me on the surface to suggest a good balance between risk and safety. Of course the reaction of the experts demonstrates this is not the case at all. So call me crazy, but maybe these sales-people keen to flog their risky products would have a much harder time of it if the products were named more accurately. For example I have read elsewhere that "balanced funds" can have as much as 80% in shares. Well maybe the percentage of equities should be in the title of the fund? That way it would be clear what they were selling and anyone who actually would be a lot more comfortable with say 50% or 30% shares would see straight away that the fund was not right for them. Interestingly though, this was not picked up by the programme. Perhaps they needed a lay-person among the experts to point out that the definition of the word balanced that they all seemed to intuitively understand actually meant "pretty risky" doesn't mean that in plain English! You can still watch the programme for a few days via this link. I've had numerous debates over the last few years with people about the definition of a political tribalist and the fact that I do not think of myself as one of them. I have had counter arguments posed such as the mere fact that I go out knocking on doors and delivering leaflets for a particular political party (in my case the Lib Dems) by definition makes me tribal. I disagree with this quite strongly. For me, tribalism is the sort of "my party right and wrong" attitude that I see from the more partisan political activists, perhaps epitomised by the sort of person who opposes a policy simply because it is from another party. I had a discussion last year with a Labour activist who claimed that there had never been a Liberal/Lib Dem policy that he had agreed with. Ever. To me that just seems utterly preposterous and completely lacking in credibility, especially given that the overlap between Liberal/Lib Dem and Labour over the years must have meant in the past that plenty of those policies must have essentially also been Labour policies at various points. But that's the sort of thing I am talking about. The worst day and the worst decisions of the Blair and Brown years would be better to live through again than the best day of the mob running Britain now. That to me shows the mindset of a tribalist and one that I just cannot empathise with. Luke is saying that the day that David Kelly committed suicide following being named by a "outing" strategy devised by the Labour Party media machine is a better day to live through than the day David Cameron unequivocally and with widely praised Statesmanship accepted the findings of the Bloody Sunday inquiry in full. He is also saying that the day the records of 25 million people went missing from the Child Benefits system is a better day than when nearly 1 million of the lowest earning workers in the country were taken out of tax altogether. I could go on. For me, that sort of thinking does not add up. Of course I accept that Luke thinks overall the 13 years of Labour government were better than the last year of the coalition. But to think every single individual day of the years running from 2nd May 1997 through to 11th May 2010 are all better than any of the days since then is what I define as tribalism. It's the sort of thing that in a speech from the podium at Labour conference would get great cheers but that does not stand up to scrutiny. And I would say this about any government's record against any other. I grew up in a family that had very strong views about Margaret Thatcher and were against much of what she stood for but the day that the Falkland Islands were liberated from Argentine occupation would be high up there in the best days for this country of the last 30 years. And despite the fact that I have spent the last few years campaigning for the Lib Dems and against the Labour Party I would highlight the decisions to give the Bank of England control over interest rates and the introduction of the minimum wage two of the best decisions any government has ever made. Tribalists exist in all parties. Sometimes they are interesting to listen to even putting aside the somewhat hyperbolic tendencies. Sometimes they bore the pants off me and I stop listening. But I will never consider myself one of them. 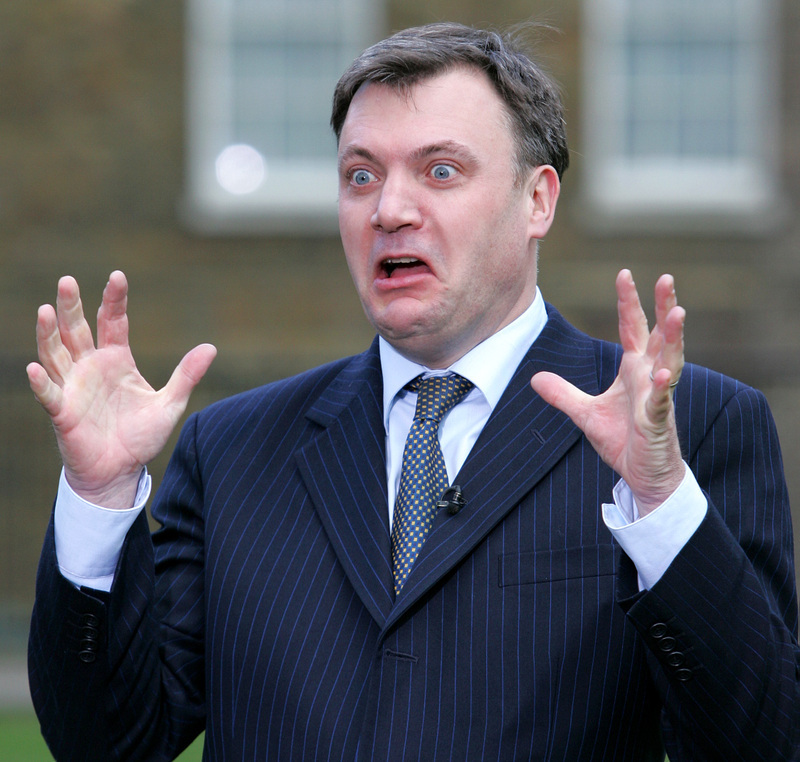 I'll be honest, I have never liked Ed Balls. I used to struggle to put it into words but he has always come across as slimy and disingenuous. For me, previous claims he has made about his innocence regarding any role he might have had in trying to oust Tony Blair did not ring true. And he has kept up the denials through thick and thin. When Andrew Rawnsley published his book last year "The End of the Party" which went into great detail about Brown's various alleged plots and Balls' role in them I remember categorical denunciations from Balls on the media. Not only that but Rawnsley himself and his reputation was traduced by various Labour figures and especially a lot of the more partisan activists on Twitter. But isn't it funny how the more the concrete evidence comes to light, the more the sort of picture that Rawnsley was painting becomes ever more clearly true? The Telegraph has today published details of letters that apparently are from a box that was supposed to go to Balls but has ended up in their hands. They include correspondence between Gordon Brown and Tony Blair from 2005 and 2006 with content and handwritten annotations that make it completely clear that not only was Brown actively plotting to overthrow Blair from at least 2005, but that Balls was up to his neck in the scheming too. That makes his previous on the record claims that he was "never ever" involved in attempting to undermine colleagues now provably untrue. The Labour Party should reflect on this and consider whether they really want someone who is happy to go onto the media and say things that are blatantly untrue in such an important position as the Treasury brief. Not to mention how someone who has been so disloyal in the past will now struggle to inspire loyalty in other colleagues. The Labour Westminster Village may have known what he had been up to and have been largely willing to overlook it but there is now a smoking gun so the rest of us can see the truth of the matter too. For that reason I now suspect that any residual future leadership ambitions for Mr Balls have bitten the dust. He is far too compromised by his past. There has been a slightly worrying tendency of late for my party, the Lib Dems to say one thing in terms of policy campaigns but then on the ground in practise to do something else. The two examples that have reared their heads in the last few weeks are the situation regarding interns and most recently the security measures for Lib Dem conference. In both cases the party at the highest level is campaigning for something, in the case of interns it is to ensure they are paid a fair wage, in the case of security measures such as ID cards it is to scrap them and only have things that are absolutely necessary and proportionate in place and yet in both cases the party has very much been found wanting when it comes to practising what they preach. The interns campaign is something I have been behind for a long time. It is terrible for social mobility in this country that some of the best and most coveted positions are only available to people who can afford to live without a wage for months on end and hence only end up going to those with wealthy parents. I was delighted when Nick Clegg threw his weight behind the campaign as Deputy PM. However more than two months later, not only have some individual Lib Dem MPs been advertising for unpaid interns but the party centrally has even been doing it. I am afraid this is just not on. It is simply not credible for us as a party to campaign on this issue if we are not willing to put our money where our mouth is. The security arrangements at conference issue is a bit more nuanced in that there does have to be some security. But the way in which the party has gone about imposing the new measures does not leave me (and many other Lib Dems from what I have picked up) with a good taste in my mouth. I think the worst aspect of it is that what appears to have happened is that the police have asked for something (to have all sorts of information about putative attendees which they can then use as a reason to ban them from conference if their vetting processes say so) and the party has simply given it to them. This might be an unfair characterisation and I stand to be corrected in the comments but this is the way it is coming across. This party has campaigned for decades for civil liberties and was particularly vociferous in its opposition to ID cards. I remember one of Tony Blair's main arguments for ID cards at one stage (the arguments changed regularly as I recall) was that "the police want them". The security arrangements for conference seem to have exactly the same argument underpinning them and this does not sit easily with me. I am not saying there need be no security measures but aspects of this such as the data being stored "indefinitely" and the inconvenience and cost especially for younger members should be being challenged by the party. I hope that the party can learn from these two different but related issues that if they are going to campaign on something, they need to be willing and able to put the principles being espoused into practise. That way the party will be leading the way rather than effectively saying "Do as I say, not as I do".